What do you get when you cross perfect weather, 300 + spectators, 51 jumpers, and a 15 foot square hole in Lakelse Lake? The 13th Annual Kermodei Bear Swim... 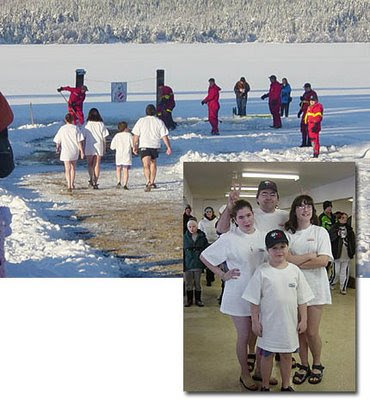 This was the first official event of the "Year of the Kermodei" and was kicked off by city administrator Ron Poole and our very own MLA Roger Harris leaping hand in hand into the frigid waters of Lakelse Lake "taking one for the team" so to speak. Pictured above are 2003-2004 Kinsmen Vice-President Colum O'Donnell with his kids and fellow jumpers Kyla, Kelly and Sean. The Kinsmen would like to thank everybody who helped set up and execute this perfect day... Click here to see the list of jumpers and thank-you's.